The general fees at Ohio Wesleyan are comparable to those at institutions of similar size and reputation. The table below reflects the direct and indirect charges for the 2019-2020 academic year. Tuition covers up to 5.5 academic units per semester, the use of educational and recreational facilities, and access to college activities. Our standard room fee is based on double occupancy in a residence hall. Single rooms, when available, cost more than the standard room charge per semester. Our average board plan involves a flexible program for hearty, average, and light eaters (our A, B, and C dining plans). All students who live in the residence halls and small living units, including Austin Manor, are required to participate in the University meal plan. 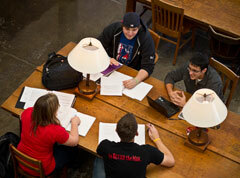 You may use our Net Price Calculator to estimate your out-­of-­pocket cost for an Ohio Wesleyan education. This tool is intended for domestic first-time, freshmen or transfer students. Keep in mind, this is an estimate and is only as reliable as the data you enter. Actual eligibility for financial aid is subject to your completion of the FAFSA, meeting priority dates, availability of funds, and your academic record.